When alive on Genosha, Negasonic Teenage Warhead had burgeoning mutant telepathic abilities. Dressed all in black, she was a teenager, somewhat gaunt and appeared like a goth with white make-up on her face and hands. She had the ability to have sleeping and waking dream premonitions about forthcoming disasters. Post-resurrection through Selene, she could identify where her fellow resurrected Necroshans were. (New X-Men I#115 (fb) - BTS) - Negasonic Teenage Warhead was enrolled in Emma Frost's telepathy class on the then mutant island state of Genosha. (Nation X#4/2 (fb) ) - In one of the classes attended by Negasonic Teenage Warhead, Emma Frost taught the class how to hack into the minds of some movie stars. (New X-Men I#115) - During another telepathy class tutored by Emma Frost, Negasonic Teenage Warhead reported on a nightmare that she had 50 times the previous night wherein everybody died. She also stated that was having the same vision there in class. At that point, Cassandra Nova's advanced Sentinel force began its genocidal sweep of Genosha. (New X-Men I#116) - After being dug out by the Beast and Phoenix (Jean Grey), and surviving because of her diamond form, Emma Frost carried the corpse of Negasonic Teenage Warhead up from underground cover and proclaimed the teenager to be a credit to "her family and other species". She ordered some human members of the rescue team to revive the girl, but they declared that she'd been dead for hours. (X-Force III#22) - Negasonic Teenage Warhead was resurrected by Selene using a strain of the alien techno-organic virus, but predicted that she would soon be dead again. (X-Force III#23) - Standing beside Selene and the resurrected Thunderbird (John Proudstar), Negasonic Teenage Warhead predicted that he would soon be fighting his brother, Warpath, but that they would all be dead again. (X-Force III#24) - Still by Selene's side, Negasonic Teenage Warhead advised her of her hit squad's progress in attacking the X-Men's haven of Utopia and watched them teleport in. 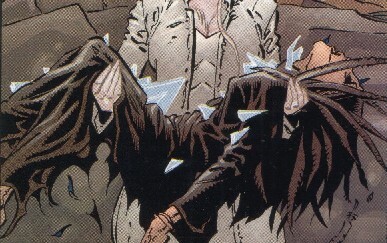 She was also aware of Destiny's struggle elsewhere but was later caught up in the destructive wave across Necrosha triggered by Selene's rise to power. (Deadpool & the Mercs for Money II#1 - BTS) - The Mercs for Money were hired by Umbral Dynamics to capture Negasonic Teenage Warhead, who was supposedly a danger for herself and others due to powers based on radioactivity. (Deadpool & the Mercs for Money II#1) - Foolkiller of the Mercs for Money watched Ellie through a window in her home in Albuquerque, New Mexico and felt like a creeper. She was texting with a friend when her powers suddenly showed her the near future. 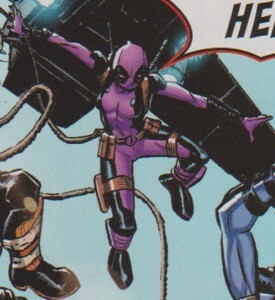 Always a step ahead of the individual members of the Mercs for Money, Ellie managed to defeat Solo, Slapstick, Stingray, Terror and Foolkiller before surrendering to Deadpool and Masacre because she saw a future when Deadpool would promise to not leave her behind. Terror wondered if they should tell her parents what was going on, but Ellie told him there was no need to. When the Mercs for Money drove off with Ellie in their van the home of Ellie vanished. Deadpool and the Mercs for Money handed Ellie over to Umbral Dynamics agents in hazmat suits, who had the suits on as precaution even though she was not yet emitting radioactivity. Though they promised she would be in good hands Deadpool had a hard time believing them. While they took her away Ellie saw the near future when she was experimented on by Umbral Dynamics. (Deadpool & the Mercs for Money II#1 (ff) ) - At the Umbral Dynamics HQ in Bagalia Ellie got a new haircut and put in restraints on a chair where her vast powers were siphoned off. (Deadpool & the Mercs for Money II#4 (fb) - BTS) - Caroline Le Fay, the leader of Umbral Dynamics, used the energy siphoned from Ellie and the others captured by Deadpool's team to revive her Russian ally the Presence. (Deadpool & the Mercs for Money II#4) - After learning of Umbral Dynamics' evilness (from undercover agent Machine Man in the previous issue) Deadpool broke into their HQ in Bagalia to free Ellie. He found her cowering in a cell after taking out numerous guards (robotic and human) and was immediately warned by her of an upcoming attack. While Deadpool tussled with Titania, Scorpia attacked Ellie to return her to her box. Surprisingly Ellie proved to be much stronger than Scorpia anticipated. Ellie picked her by her tail and tossed her around like a doll, even threatening to use her body against Titania. When a hologram of Caroline appeared to reveal what she was doing with Ellie and the others captured by Deadpool and his team, Ellie was mad at first because she couldn't believe Deadpool was working for her. Deadpool revealed he never knew who was behind Umbral Dynamics and actually believed he was doing something good. 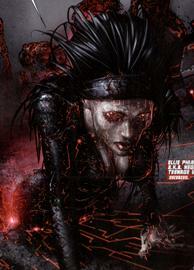 Caroline then introduced Presence, who had been woken up with the powers siphoned off Ellie and the other prisoners. Presence quickly hurled Deadpool into the nearby jungle. (Deadpool & the Mercs for Money II#5 (fb) - BTS) - Ellie was returned into her cryogenic chamber. (Deadpool & the Mercs for Money II#5) - When Deadpool, joined by Domino, Gorilla Man, Masacre and Machine Man, attacked Umbral Dynamics again he freed Ellie and the other prisoners by shooting their cryogenic chambers. Released from her prison Ellie was protected from Titania and Scorpia by Deadpool. She remembered the the promise Deadpool would make to her in the future before he asked her if she had any power she could use against Presence. Ellie absorbed all the radiation siphoned off of her and the other prisoners into her own body, dissipating Presence's form in the process. Ellie returned with Deadpool's new Mercs for Money to the mercs' heavily damaged Schaefer Theater HQ and decided to stay with them because she was unable to return home anyway. (Deadpool & the Mercs for Money II#6) - Domino sent Ellie to tell Deadpool they had a job. She surprised him in a dark corner in the Schaefer Theater while he was playing with action figures. She was a bit miffed that a troll doll with a shaved head was supposed to be her and didn't even want to know why Deadpool had a whole crate of Domino action figures. She told about the job and to be ready in 30 minutes before assuring him that she was on his side even though Domino was now making the decisions in the field. They talked a bit more about putting Deadpool back in charge of the team and Deadpool thought what they needed were new uniforms. Ellie promised she could make that happen. When the Mercs for Money arrived in Atlanta, Georgia to take down the mecha-big top base of the Circus of Crime, Ellie created alternate Deadpool costumes out of thin air while they dropped on to the Big Top for their attack. Though Domino was mad at Deadpool and Ellie for helping him that way, the team fought the Circus of Crime in their new uniforms. Ellie easily took out Clown, whom she made float after breaking apart his unicycle. After the battle Deadpool kept berating Domino for keeping Hit-Monkey, who had shoot Deadpool as soon as he had arrived at their HQ. Ellie didn't support Deadpool's wish to get rid of Hit-Monkey because she thought the monkey was kind of cute, right before Hit-Monkey shot Deadpool again. Back in their regular outfits the Mercs for Money arrived on S.H.I.E.L.D. Helicarrier Triton to pick up their payment. Ellie overheard Domino talking with Deadpool about her powers. She was present when Agent Haines revealed S.H.I.E.L.D. had actually sent Hit-Monkey to the Mercs for Money as Deadpool had expected, but claimed he was just supposed to be a liaison for them. She then revealed that their payment for the Circus of Crime job was transferred to their accounts as their were speaking. When Deadpool went to pick up Ellie for the battle against the Inhumans she was gone, which made him kinda happy because he thought she should sit this mission out anyway. He was unaware Ellie had decided to look after Deadpool's daughter until this crisis was over. (Deadpool & the Mercs for Money II#9) - Ellie joined the Mercs for Money to deal with Deadpool's wife Shiklah, who had conquered Manhattan with the monsters of Monster Metropolis. Afraid they would be obliterated by an army of monsters immediately they decided to put on monster costumes when Hit-Monkey just walked through the monsters. Ellie put on demon horns to change her appearance, which proved to be enough. Going up the elevator at the Rockefeller Center Ellie felt that they were found out. A fight ensued on the 43rd floor between the Mercs for Money and a group of monsters, but Machine Man pulled them out of the fight and took them all to the top floor to reach Shiklah before she could put all humans to sleep with the Sandman device. Unsurprisingly Gorilla Man fell under her control. (Spider-Man/Deadpool#16) - Gorilla Man attacked the Mercs for Money, knocking out Ellie before throwing Masacre and Domino off the building though they managed to hold on to a cable. Hit-Monkey talked some sense into Gorilla Man, who saved his teammates from falling to their death. Ellie regained consciousness and hoped Spider-Man and Deadpool were able to find Dracula. Ellie and the rest of the Mercs for Money attacked Shiklah once again, but when she activated the Sandman device using the Scepter of the Manticore the Mercs for Money fell asleep immediately. (Deadpool & the Mercs for Money II#10) - Machine Man was just pretending and unsuccessfully tried to wake his team up again. Failing to do so he carried them through the corridors, feigning to be asleep each time they ran into monsters. Eventually Machine Man destroyed the Sandman device, waking up all humans in Manhattan including his team. (Deadpool VI#29) - After Shiklah got married to Dracula, starting a reign of terror in Monster Metropolis, which was quickly ended by the monsters themselves, who opposed Dracula and his vampires. The Mercs for Money watched Deadpool fight his ex-wife Shiklah and didn't interfere because Deadpool was broke and couldn't pay them anyway. Ellie and Masacre decided to take down the winner after the fight was over. The battle ended and Shiklah decided to leave town with Dracula. The Mercs for Money did nothing. (Despicable Deadpool#298) - Ellie attended a meeting alongside other former allies of Deadpool (including pretty much all former members of the Mercs for Money, Luke Cage, Iron Fist, Daredevil and Jessica Jones) with Captain America and Maria Hill to find a way to bring in Deadpool peacefully. (Domino III#1) - Ellie attended Domino's birthday party in San Francisco. Comments: Created by Grant Morrison (script), Frank Quitely (pencils) and Tim Townsend & Mark Morales (inks). 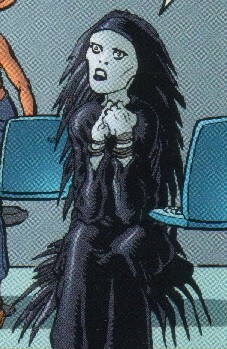 Omar Karindu notes that this character was named after a song by the grunge/metal band Monster Magnet. More precisely a song from their album "Dopes To Infinity". 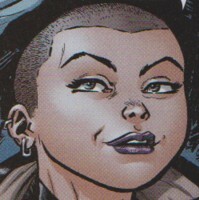 In Joss Whedon's Astonishing X-Men III#12-17 (February - November, 2006) Negasonic Teenage Warhead was part of the illusory Hellfire Club (also including Perfection, Sebastian Shaw and Cassandra herself) created by Cassandra Nova within Emma Frost's mind. Negasonic Teenage Warhead's return from the dead seems to be a result of her popular appearance in the movie Deadpool (2016) and its sequel in 2018. Deadpool's Negasonic Teenage Warhead and the one from New X-Men are so different from each other they almost seem like two distinct characters. It is unknown if she always possessed reality-altering powers or if these powers manifested following the destruction of the Multiverse. It is also possible this version of Negasonic Teenage Warhead actually hails from an alternate reality and became part of the main Marvel Universe not unlike other characters (see Spider-Man/Miles Morales or the Maker/Reed Richards). In Deadpool Annual III#1 (November, 2016) by Duggan & Posehn with art by Koblish Deadpool shared an adventure with Firestar and Iceman in a reality reminiscent to the Spider-Man and his Amazing Friends cartoon. At the end of the story Deadpool sought new roommates, but was disappointed when Negasonic Teenage Warhead and Colossus turned up on his doorstep (so where they because they believed Spider-Man had put out the ad). Different N.T.W., but a fun tidbit nonetheless. Mercs for Money update by Markus Raymond. Any other "Nega-", "Teenage" or "Warhead" characters.